Customers, Investors and grant funders often won't take you seriously until they see prototypes and preliminary data, and the Cornell National Nanoscale facility is the ideal laboratory for creating proof-of-concept microfabricated and nanoscale devices. I can create such devices for you. I've worked on R&D devices at the Cornell National Nanoscale Facility (CNF) since 1998, mainly focusing on implantable biomedical devices. As a result I'm very familiar with the fabrication processes associated with semiconductor research, and can write proposals & prepare videos based on this first-hand experience. Note that because of this experience, I was selected to create a series of chemical safety videos for the CNF General Chemistry area. This knowledge would benefit any company that needs prototypes, grant proposals and publicity videos associated with nanofabrication and MEMS research, and especially projects involving implantable microfabricated devices. My most recent project involved microfabricating flexible, bio compatible polyimide circuits at the Cornell National Nanoscale Facility. These flexible circuits were part of the Boston Retinal Implant Project - a long-term research project to develop an implantable retinal prosthesis - a system that restores site to people blinded by advanced macular degeneration. 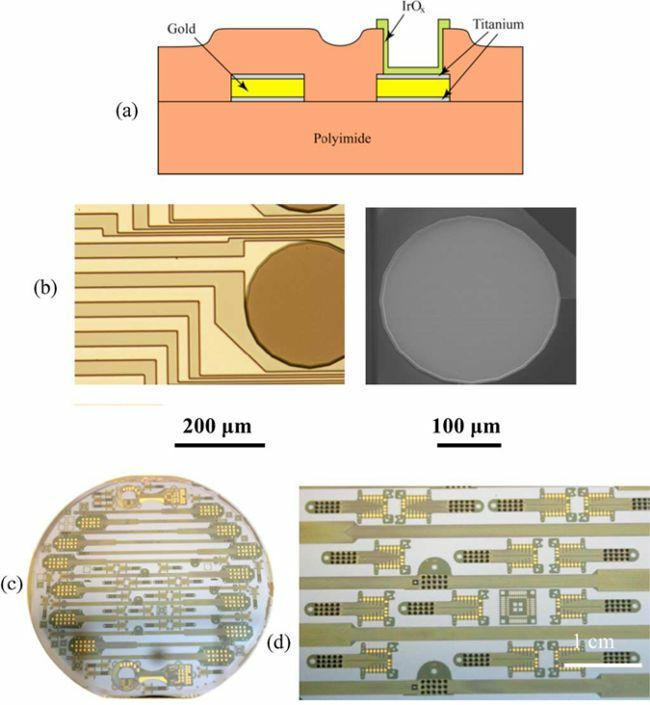 This project involved building up polyimide flexible circuits on a silicon wafer. These circuits were 10x thinner than state-of-the-art commercial flexible circuits, and incorporated electrical contact pads and >100 sensor locations. The circuits I built were proprietary to the Boston Retinal Implant Project, and the following pictures show design iterations. This device - developed under NIH/NHLBI SBIR funding - was a miniaturized ultrasonic transit-time blood flow probe for use in mouse physiological studies. The device was developed in consultation with Drs. Tom Smith and Mike Callahan at the Wake Forest School of Medicine, who also developed the surgical protocols for device implantation on the mouse kidney artery. Part of the design work was done at the CNF, where I developed a unique thick-film SU-8 photopolymer process for creating large & thick dual-layer structures (>500um) per layer (see left picture on page banner), as documented in this 2007 CNF Research Accomplishments page. This probe body is a critical component for the commercially successful Transonic Nanoprobes. The product based on the CNF body design was extremely successful - it has been in commercial production since 2002, and in testimony to Congress the NIH cited this project as an SBIR/STTR success story. In this project I developed a process for depositing crack-sensing electrodes onto Inconel specimens (part of a NASA Phase-I feasibility study for funded Phase-II SBIR Smart Coatings for In-Situ Monitoring of Engine Components).